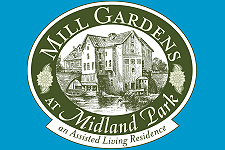 Mill Gardens at Midland Park is an assisted living residence located in Bergen County, New Jersey. Mill Gardens is nestled in a tranquil, residential neighborhood. Our 68 apartments are spacious and affordable. Each unit is equipped with a kitchenette consisting of a refrigerator/ freezer, a microwave oven and plenty of cabinets. Individual thermostats enable each resident to control room temperature to their comfort level. There are numerous common areas for all residents to enjoy including beautifully appointed parlors, the club room and game room, the delightful arts and craft studio, the cozy library, our private dining room and the hair salon serving men and women. The main dining room features restaurant style dining with daily menus and plenty of choices along with a dedicated wait staff.